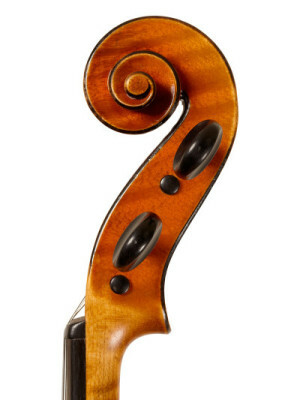 Ansaldo Poggi (1893–1984) followed his father’s amateur interest in violin making and in 1921, after serving as a messenger in World War I, he left his hometown of Bologna to study with another Bolognese native, Giuseppe Fiorini, in Zurich. He was undoubtedly the most accomplished of Fiorini’s pupils, although he later asserted a good deal of stylistic independence from his teacher and developed his own models. Despite hardship early in his career, he worked steadily for over 70 years. By the 1950s Poggi’s reputation for making consistently good-sounding instruments had given him the financial stability that eluded many of his contemporaries. 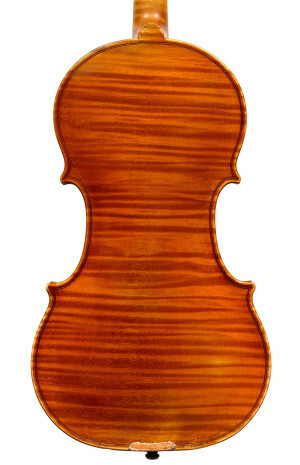 Poggi’s unique style and clear personality are evident in this 1961 violin: the model of the body is based on Guarneri ‘del Gesu’ but the head follows Poggi’s own personal model. The painted scroll chamfer is generally an earlier phenomenon in Poggi’s work, though the brands at the lower rib and to the inside back are consistent with his instruments after 1920. As is typical after 1940, this violin is inscribed to the inside back.